This is an advertisement for Archibald Neagle, an advertising agent based in Albany Street near Regents Park in London. At this time advertising agents were either brokers selling spaces for advertisements in periodicals and other publications, or were jobbing printers producing posters, leaflets and trade cards. From the 1890s agents saw the potential for advertisements in making people aware of products and this encouraged firms to specialise in different types of advertising. 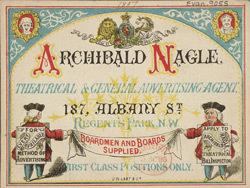 Archibald Neagle specialise in theatrical advertising and would have produced playbills, programmes and leaflets promoting both the productions and the stars appearing in the numerous Music Halls and Theatres around London.